Like the improvements proposed in the 2014 Master Plan, however I’ve always desired a more urban edge to the park along Martin Luther King, Jr. Blvd. I hope this changes in the future. Any updates on Charter Sq N or the Edison? Have Done Jennifer ! Thanks so much Leo & Will for your extra help today ! @Bob I heard Edison office was delayed…. Hopefully the Edison is delayed for a better, taller project. Raleigh submitted their grant request to expand EcoPRT. Let’s hope they get it! I’m with you Paul. This could be a really awesome break out moment for the city and NC State. Where did you hear the Edison office was delayed, and why? Also, taller and better? It’s a pretty decent building. The apartments were the disappointing part, but they’re 2 months away from being finished. I just read a story from last summer saying the Edison office would start construction in the fall, and here it is February and there are still buildings on the site. I’d say it has been delayed. If they did delay the Edison and eventually built a building as tall as PNC Tower in that spot, I think I could possibly maybe forgive the Edison Apartments. Edison was suppose to start last fall. They have not closed on the land at 307 S. Wilmington Street so you can get permits to build a building on land you don’t own. :) They also would have to do a recombination to make it one lot. Please take my word for this , BC is the man ! You can take it to the cleaners on his info. ! So Reliable Loan hasn’t sold their building yet, is what you’re saying? I contacted them a few months ago and they said they were moving to the end of the block. Any idea what the plan/timeframe is then, at this point? Not to be too pessimistic, but there is a lot more to building tall office buildings than just desire. I hear a lot of chatter here about why not taller, why not bigger? What’s taking so long. We need 40 stories! These decisions are largely based on economics. Developers need financing, to get financing you need to have your own deep pockets, clout or commitments from tenants. Many of the downtown proposals are competing with each other. Some are stalled (Edison), waiting (Charter Square), or moving forward (Dillon). While the Edison and Charter Square have made slow progress trying to land commitments and to secure financing to buy land or begin building, the Dillon has jumped ahead. The Dillon with its strong developer with proven track record, deep pockets, and ability to land capital has already had its launch party. A lot of square footage is being proposed and the demand isn’t there yet. One way to move forward would be to land a large tenant moving to Raleigh who wants a downtown presence. Unfortunately, lots of other cities are competing for these folks too. If Jeff is correct about Reliable Loan, and I have a feeling he is (they were a problem from before they even put up the fence), that is ridiculous. I am all for retail in downtown, and you will see that I complain about the lack of it all over this blog (haha), but for a PAWN SHOP to delay the construction of a TOWER- one that will include even more ground floor retail space (though let’s get real, it’s all gonna be restaurants)- that’s just nuts. I agree, every proposal in downtown Raleigh we get bellyaching from the Supertall Skyscraper Fanbois. Height is meaningless. Filling in the gaping holes in the cityscape (parking lots, auto repair shops) is way way more important than height. If you insist that everything is 25 stores or more, you’ll get basically nothing built ever. No mention yet on what’s planned but considering the price paid it’s gotta be something tall. I’m really glad Kane is involved downtown and he’s smart to move forward with the Dillon before Charter Square and Edison come out of the ground. In fact, these projects might be delayed further as a result. Early bird gets the worm as they say. That would be a shame to lose the Southland Ballroom – I’ve never actually seen a show there (and they generally don’t attract great shows anyway) but A: it would be yet another music venue lost (I considered Tir Na Nog to be a venue, in a way), and B: I think as our city grows, and the music scene grows with it, I always thought that Southland could eventually become a premiere club at some point. I love the growth, and love what Kane does, but damn why can’t he buy up all the surface parking lots first!!?? Stew, that’s quite interesting. You have to wonder if Mr. Kane is eyeing the area around that lot for serious redevelopment. Southland has their niche and they pull some great bands, IMO. This is really unfortunate news. So that leaves us with the Lincoln, Kings, and the Pour House for downtown venues of 100+ capacity? Jeff, I checked the other day and the lot is still in Horowitz name. Part of the agreement was they had to build a new spot for Reliable Loan to move into. This resulted in numerous safety issues as you would be building around/over an existing occupied building. He owns the land and guess not enough $$ to go on vacation until new spot is built. There is more but can’t disclose. As for the comments about Dillon/Kane, they are proceeding at full speed and The Dillon will have a impact beyond his development. BC, are you saying they are waiting for the apartments/retail next door to be completed so they can move there? Reliable Jewelry replied to me and said they are in fact moving into the ground floor retail of the Edison Apartments in June/July. So maybe the office building will start then? Sounds like just a delay, not a shelving of the project. While street level activity and density are more important to the evolution of a truly urban downtown Raleigh, symbolically the city could really use at least one 500 foot (not including spire) building. Either Condo/Apt., mixed-use or office. Believe it or not, a tall iconic building will spur further development, just like the Batman building did in Nashville. Dave : I’m hoping that The N&O Site will make this happen ! Fingers Crossed ! I agree with you, Dwight. I have so much hope for the N&O site! Right now, it sounds like North Hills will have a 40-story building before downtown, which is sad. I had high hopes for the 301 Hillsborough development, but now it seems that site will be a underwhelming 20-stories. But I don’t really get it. Why is a 40 story building so symbolically important? When I think of symbolism and skyscrapers, literally the first thing that comes to mind is the phallic symbolism of it. It just seems so petty. Hey, if you think phallus thoughts regarding building height, that’s your business. A tall building is symbolic for getting things done and not sitting on your hands. Provided the market can bear it, it demonstrates growth with density, the higher the building height. Having an iconic building, like the The B of A tower in Charlotte or the Austonian in Austin, trail blazed subsequent growth. And if it provides aesthetic beauty, all the better. Raleigh is a growing city, but the downtown footprint is not all that big. You have to build up to keep up with future growth. Raleigh is not Charleston or Savannah. I don’t see any problem with having one 40 story 500+ foot skyscraper in a fast developing mid sized city like Raleigh. I don’t really agree with the every new project needs to be 30-40 stories crowd. Not my thing,but I do think it about time for Raleigh’s new tallest. Hopefully the N&O site will make that happen. With all the projects underway and coming soon. A 500′ project would be icing on the cake IMO. I don’t have a problem with North Hills either. I think it’s a positive thing. Frankly it seems to be the developers holding DT Raleigh back. They can’t get much going. While Mr Kane comes in and starts a $150 million project in about 6 months. DT or MT. I’d be willing to bet site he just purchased recently DT. Will break ground before most of the projects we’ve known about for years do anything(Edison Office). Maybe we’ll get lucky. Maybe Mr Kane will build a 40+ DT&MT. I’d be happy with that. Remember it’s all Raleigh. LOL @Dave. I was going to say the same thing. It’s not that bigger is better, or that every project that isn’t 40-50 stories tall is a disappointment. It’s that none of the buildings being proposed are ever that tall. I had friends visit downtown during the holidays, when it looks especially nice, and they thought it was “cute” having a little downtown. Like we live in Apex. My friends had a great time and really liked Raleigh. 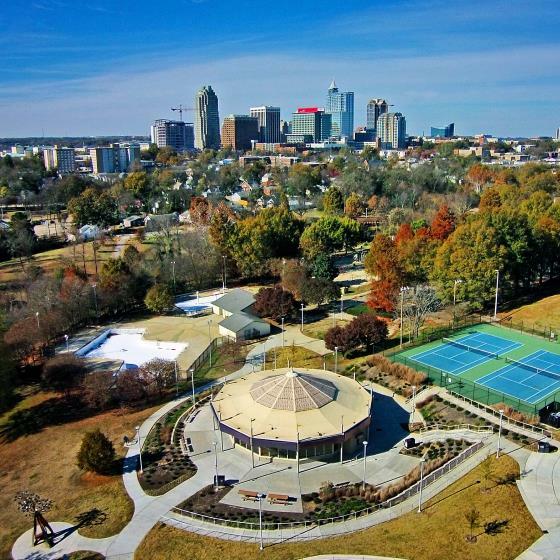 It’s just that if people who are pre-disposed to like Raleigh have that first impression, what are conference and business visitors going to think? People keep seeing Raleigh pop up on lists, but when they come to check it out, the downtown (which most people judge a city on) doesn’t do much to impress. Yes we need significantly more retail, in concentrated areas. Yes we need some infill projects. But having 3 30+ story buildings and 1 40+ story building would make it look like a real city for the first impression. As far as North Hills, it’s great that we live here and have access to it, but it definitely hurts downtown in terms of attracting tenants and business. Just imagine all of that downtown: shopping, movies, bowling, tall buildings, restaurants, outdoor music, apartments… I’m hopeful they can both grow, and John Kane definitely seems interested in making that happen. I’m still optimistic, but when the Edison and Charter Square have so much trouble getting tenants, it’s not good. My ideal vision for downtown Raleigh is blocks and blocks of contiguous walkable urban environment, where you could stand at the corner of Hargett and Fayetteville and walk six blocks in any direction and encounter nothing but lively livable urban development with lots of retail and no parking lots. Whether that development is three stories or forty I don’t care. Don’t get me wrong, I have nothing against skyscrapers. If somebody wants to build a skyscraper I think we should absolutely let them, and I think the 20 and 12 story limits throughout much of the core of downtown are completely unnecessary. But at the same time, skyscrapers are also somewhat counterproductive to my goal for downtown since they concentrate too much density onto one single spot rather than filling in all the hundreds of lifeless, empty spots that make our downtown into such a patchwork of disconnected districts rather than a contiguous whole. I want to see all those gaps filled in IN MY LIFETIME. A monomaniacal focus on just TALLER TALLER TALLER will never achieve that. Honestly I also think if that downtown freeway had been built back in the 70s, we would probably have more skyscrapers because they would be more visible and thus more valuable as advertising. Nevertheless I think that downtown is better off without a downtown freeway because the way the streets flow uninterrupted into the neighborhood of Oakwood is just awesome. Downtown would do way more to impress people if you could stand in the center of downtown and walk in any direction for a mile and never get that creepy feeling like you’re walking somewhere that “normal people” don’t walk. People are far more impressed by the environment and liveliness of a downtown than the height of its tallest building. The average person does have an appreciation for skyscrapers, yes, but it’s not as big a deal to them as it is to a skyscraper fan. Dave, you say that Raleigh is not Charleston or Savannah or Asheville and I agree, but I think striving to have an active, walkable environment like that will yield a far better downtown than trying to be the next Houston or Dallas. I’m also not saying that skyscrapers and active urban environments are mutually exclusive, but I feel like if all the people advocating so strongly for skyscrapers instead turned their energy towards advocating for a more active walkable downtown, we’d get more results out of that advocacy much more quickly. What makes people want to live downtown and be downtown is not skyscrapers. It is amenities and the environment. That should be our primary focus. I realize that you guys want that too but sometimes it seems like all I ever see on these comments is more complaints about our skyscrapers are too few and too small. I’d just like to see more of that energy and frustration directed somewhere other than just towards the height of buildings, because that’s what I feel really matters. orulz, Livable/walkable streets with bustling street level activity for downtown is a separate and not mutually exclusive discussion from having an iconic tower or two. Raleigh needs to do both. However, a tower can be built with or without a great livable environment. My point is I believe that an iconic tower would spur more street level activity by bringing more people to downtown. I am not advocating Raleigh become like Houston, Dallas, Atlanta or even Charlotte for that matter. I think Raleigh has the potential to be a smallish hybrid of those large cities and the small quaint southern cities. Similar to San Antonio’s downtown (scale). I support all of the preservation of high quality historic buildings, the old churches, and the parks and green spaces. I support downtown grocery stores and movie theaters, etc. I believe you can meld southern charm with the modern structures, without overdoing the modern skyscrapers. However, at this time, downtown Raleigh has a tiny land mass footprint. There is a limited amount of space to enjoy the non creepy (your quote) feeling. There are projects underway or proposed in the Warehouse District to better connect Glenwood South and Fayetteville St. North, East, and South of downtown will take longer to develop. BTW, most skyscraper proposals I’ve seen over the years (built or proposed) have been on or within a block or so of Fayetteville St. Certainly nothing that would interfere with developing street level activity across downtown as a whole. With all these new developments, if the city is going to go tall, then they need to be unique and creative. If we want to be the Arts Capital of the South, the city needs have a greater influence on development. I am so underwhelmed by all the short, bland architecture that is being proposed (with exception to the Dillon, IMO). Charter North, Edison, the hotel on the Enterprise lot, etc. If you’re not going to be tall, be unique. Otherwise, it’s a wasted opportunity. I’m also not of the opinion that height is missing or needed at any particular level downtown. If height is what gets people excited about a place, then I think those people are missing the driving points of density in the first place. First and foremost density is about efficiently living on this planet. Not trying to impress. As an engineer, sure, tall buildings impress me to a degree. But they do not impress my hobbyist inner urban planner. What impresses me is very different. Without writing up a paper in this thread, what I think of as mid level density is the sweet spot, with the majority of structures from 3-12 stories. Again, I’m leaving off all my justification for this for now :) One final thought, is that IF there were such a proposal I think your best spot is take out the two parking decks immediately west of the Sheraton and have it at. The west facing slope there, will make it seem that much grander, and the fact that this spot is surrounded by modern buildings already lends itself to being appropriate. Not to mention that parking decks are as much a blight as are parking lots in my opinion. Friends, as we all know, the drive in from South Saunders is Raleigh’s money shot. The view from the south/southwest is the postcard image that the city has used to promote downtown for the past 25+ years. With that being said, a taller tower at the enterprise lot (or anywhere west of salisbury / south of davie) would block out the buildings that we currently have and could possibly hide the PNC tower when viewed from the south. The lot across hargett st from Raleigh times / across wilmington st from Sitti (surface parking lot and M&F Bank)would be the ideal place for a taller tower that could compliment the skyline without messing up the south saunders money shot. The tower would rise beautifully between PNC and Wells Fargo, with the jail and old courthouse in the foreground. Cheers! Bam , Yes, this would be a great tower location ! Also @ this location , the skyline shot from Boylan Ave.bridge would be super ! WRAL’S nightly aerial shot would be great ! That lot is way too small to make it worth anyone’s time to build tall there. It’s less than a quarter acre. You’d be talking usable floor space of like 5000 sqft per floor by the time you subtract support structure, elevators, wet walls etc. I envisioned a building sort of like Jason Queen’s Hobgood building over by Remedy, to go on this spot actually as far as scope goes. And if interested, the message board Urbanplanet has some folks who have thrown up some sight line renders from the money shot to see how proposed buildings might look. But really…what you’re blocking from the traditional money shot should be given absolutely no consideration when planning a building. Not to be a jerk, but that takes ‘missing the point’ to a whole new level. People living and working IN the city and their experience is the prime directive here. Mark, it is true to say that postcard perspective is foolish and shouldn’t be a deciding factor in planning. I am talking from the point of view of the city council. Remember, they gave the architect of Charter Square North a hard time because he designed his building to be aesthetically pleasing from the city plaza area (north side) and left it bare on the southward facing side. The members of council would prefer the “mullions” to be on the other side of the building, one member even stated so the building would look good from I40. Gotcha. I hope any design critique at this stage in Raleigh’s life tries to ensure the building looks nice and functions well from as many directions as possible, understanding that things like lobbies and loading bays need to go somewhere of course. Downtown should be thought of as 360 degrees now, and not facing any particular direction to the extent practicable. I do understand the concern about downtown being able to showcase itself as well as it can…as an alternative to sticking in close to the Fayetteville spine, spreading height and density farther west I think allows buildings to be seen well in photographs and spreads things out too. If it all stays along Fayetteville then it gets kind of oversaturated with density while other areas still have parking lots that kill off the environment and streetscape. One Glenwood, Dillion and the Campbell lot all hit at that idea, though I know folks are peeved at the 20 story cap at Campbell, Kay’s 1 story concession on Dillion, and One Glenwood being half the size of its original proposal but there are still some spots along Hillsborough st and also down the Daswon/McDowell pair that could host a 50 story building. OR…building on your idea, you could just knock out the Alexander parking deck and go tall there. The Capital Square historic district would require a special approval. and I’d also big a big proponent of leaving alone the Alexander Building, Centro and the newly renovated Lawyers Weekly building, but that leaves you with 1-1.5 acres to build on and sky up and over First Union/Wachovia/Wells Fargo. I think we can actually have all the things we all are interested in, if its planned well and the City engages potential developers and property owners. Cheers mate. I am of the opinion that when it comes to the scope and location of projects, the market should dictate things full stop. Fretting over sculpting the perfect skyline, worrying about hiding buildings, etc, silly 20 story limits in most of the CBD, gets in the way of development. Ground level design and uses should, however, in my opinion, be significantly regulated. either way, Raleigh is a BEAUTIFUL city, If Developers want to build taller towers….fine,all the better for Downtown.